Five days into leading the nation's largest local church -- indeed, the largest diocese American Catholicism has ever known -- Archbishop José Gomez of Los Angeles is off and running... and in more ways than one. 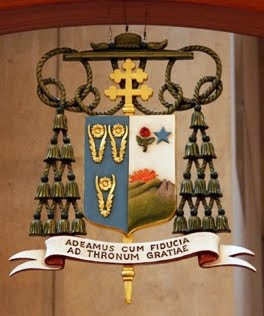 With the freshly-retired Cardinal Roger Mahony gone from the scene for several weeks out of deference to his successor, come Sunday, the fifth metropolitan of the 5 million-member LA church will close the week of formal celebrations of his ascent by celebrating the main English and Spanish Masses in what's now his cathedral. From there, the 59 year-old prelate veers headlong into Lent, but not before helming Tuesday night's Inaugural Liturgy for the new president of LA's Loyola Marymount University. The largest Catholic college in the West, the Jesuit-founded school's incoming chief, David Burcham, isn't just the first layman to hold the post, but likewise the first non-Catholic. And once the 40 Days begin, it'll be all of a week before the archbishop both experiences and leads his first edition of the City of Angels' marquee ecclesial event: LA's Religious Education Congress, now in its 45th year... and, with its annual turnout of 40,000-plus, the global church's largest annual gathering of ministers and catechists. All that said, it's not as if Gomez has been taking his opening days easy so far. As noted earlier on Page Three, the archbishop marked his first full day in office by doubling down on one of his key priorities, inviting the faculty of the archdiocesan seminary, St John's in Camarillo, to his cathedral residence for "dinner and conversation" on Wednesday night. Last September, the seminary was the focus of the then-coadjutor's first written contact with his presbyterate, as Gomez sought the LA priests' recommendations of those among their number who merited being sent on to advanced studies, with an eye to assigning a new crop of clerics to formation work. Speaking of personnel, while some of Mahony's inner circle quietly shifted from the Cardinal's Office to the cathedral staff over the course of the yearlong transition, the archbishop has reportedly brought one major recruit aboard. Though Gomez has repeatedly stated that his time as a priest of Opus Dei ceased on his 2001 appointment as an auxiliary bishop of Denver, the LA prelate is said to have called one of the personal prelature's elder statesmen to his side. A former director of Washington's Catholic Information Center -- a work of The Work -- Msgr William Stetson had, like Gomez, previously been stationed in Texas. 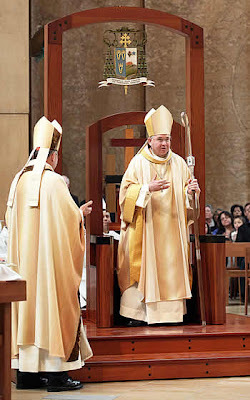 Expected to be the archbishop's "minister without portfolio," the graduate of Harvard (both undergrad and law) has long served as American secretary of the Pastoral Provision, the Holy See's initiative to discern the vocation of married ministers from other Christian communities for priestly ordination, families and all. On top of all that, Stetson likewise blogs and tweets. All this is prelude to Gomez's first major statement to the LA church -- an outline of the archbishop's priorities for his ministry that ran in this Friday's edition of the archdiocesan weekly, The Tidings. "For greater things we were born." There are many matters on my heart as I begin my new ministry as your Archbishop. But I keep coming back to these words from Ven. Maria Luisa Josefa de la Peña, the refugee from Mexico who founded our Carmelite Sisters of the Most Sacred Heart of Los Angeles. I find her words express some of my deepest desires for my ministry. I want to spread this simple and beautiful truth of the Gospel: That each of us is born from the love of God. That each of us is a child of God who belongs to the family of God, the Church. We are born to be saints - every one of us! Since I came here last May, I've put a lot of miles on my car. I've traveled our great freeways to each of our 20 deaneries. I've been blessed to celebrate Mass with many of you, and to talk with you and get to know you. I am eager to meet everyone. And I look forward to our friendships growing in the years to come. My heart is truly in Los Angeles now. I am rooting for the Lakers! I feel at home here in this beautiful archdiocese, in this beautiful state. And I'm excited to begin my ministry. I have five basic priorities as I begin my work. They are rooted in the priorities of Christ and his mission for the Church. They are priorities that the United States bishops have identified for the Church in this country. They fit well, too, with our Archdiocesan Synod's goals of promoting faith education, sacramental life, social justice, evangelization, collegial leadership and greater a sense of responsibility in ministry. My first priority is education in the faith. We need to know the Gospel. It is our light and our salvation. We need to know our Lord's words and how he lived. We need to know the teachings of his apostles and his Church. We need especially to know the Church's social teachings, so that we can live as faithful citizens. I also want to promote vocations to the priesthood and the religious and consecrated life. Our Church needs more men and women who can testify to the radical beauty of a life dedicated totally to Christ. My third priority is to help us to see the beauty of the Church's cultural diversity. The Catholic Church is meant to be a great multitude called from all nations, peoples and tongues. As Catholics, we need to break down the walls that divide us, every barrier that keeps us from being one family. My fourth priority is that we proclaim to our society that life is sacred from conception to natural death. We must insist on the rights and dignity of the human person - born or unborn; young or old; sick or healthy; no matter where he comes from or what kind of documents he possesses. Fifth and finally, we must defend and strengthen the natural institutions of marriage and the family based on the permanent and exclusive union of one man and one woman. We must insist that society respect the Church's freedom to promote our belief that the family is the fundamental cell of civilization. All five of these priorities are a means to an end. The end is this: that our Church proclaims the Gospel in all its power and truth to the men and women of our day. That is what we are here for, each one of us. We are here to be saints and missionaries. We are here to bear witness to the greater things that Jesus promises to those who love him and live by his Word and his teachings. I am humbled by the extraordinary works being done in our parishes and in all of our Catholic institutions. There are many needs and many problems - material and spiritual - here in Los Angeles and throughout California. The Church's works of mercy and justice must intensify. Every one of us must do our Christian duty to help the poor and the strangers in our midst. In all our work, let us be animated by the "greater things" of the Gospel - the beauty of knowing Jesus Christ. Through our acts of love, little and big, we can help bring our brothers and sisters closer to God. I ask your prayers for me this week as I begin my ministry. Please ask our good God to make me worthy of this beautiful task of serving the family of God here in Los Angeles. I pray for you every day. And I ask the intercession of Our Lady of Guadalupe for you and your families this week.